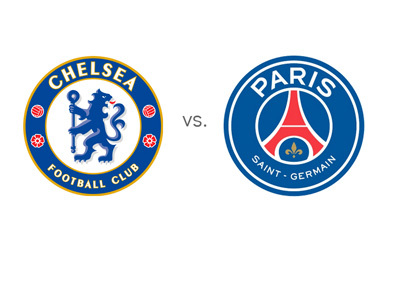 Chelsea FC host Paris Saint-Germain in the second leg of the UEFA Champions League round of 16 on Wednesday, March 11th, 2015 at Stamford Bridge in London. The kick-off is at 20:45 CET. Ivanovic probably saved the day for Chelsea by scoring the away goal in the Blues' first leg encounter with Paris St.Germain. PSG could have done better than the end result of 1-1 in that game and would have liked to come to Stamford Bridge with a least one more goal in their kitty. The French team could have got at least three goals apart from the Edison Cavani equalizer had it not been for the Chelsea custodian Thibaut Courtois who did an admirable job of keeping the PSG attacking waves at bay. Chelsea go into Wednesday's match high on confidence of being clear leaders in the EPL standings. That may probably also apply to PSG who trounced FC Lens 4-1 to temporarily reach the top of Ligue 1 standings. Edison Cavani was rested for the upcoming Champions Legua match, while Ibrahimovic looked well below his best and that should be a concern for the French club going into Stamford Bridge. David Luiz, who is playing an increasingly central and upfield role, will need to sharpen further if he wants to get a results against John Terry, Ivanovic & co.
Jose Mourinho's strategy of grinding out a draw and getting an away goal somehow in the first leg could very well work in his favor. The comfort factor for PSG with a first leg score line of 1-1 would be missing. They will have to score at least once on Wednesday to make a match out of it. PSG will be the ones chasing the game and in their quest for a goal, they could be left open to counter attack. Eden Hazard and Oscar are likely to come in fast and hard and that is where the PSG defense could be caught out. Forwards of the class of Fabregas and Diego Costa cannot be expected to remain in their shells as they did at Paris. The last time these two clubs met was in the quarter finals of the same tournament last year, with Chelsea edging out their French rivals on away goals in the dying minutes of the scond leg match at Stamford Bridge.